Tankless Water Heater Installation | Carroll Plumbing & Heating Inc.
Have you ever considered going tankless? Not only are they more compact, but they are more energy efficient than a conventional water heater. 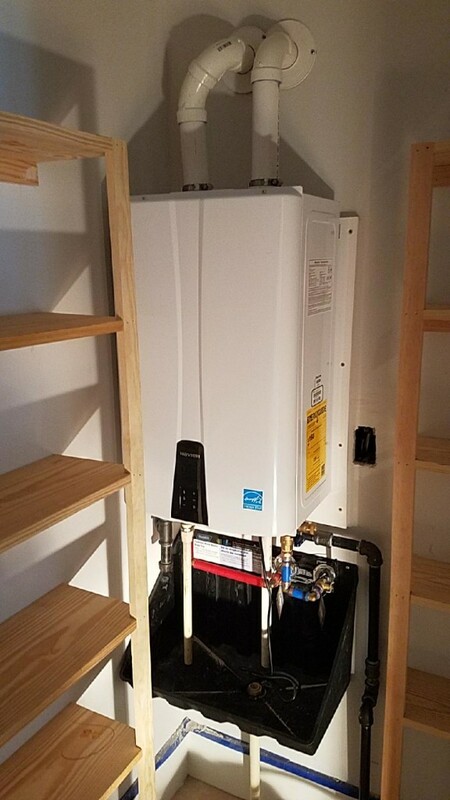 Our client, a Richmond homeowner, called upon us for water heater installation after choosing this Navien tankless model for their home, and look how inconspicuous it is in their storage closet! With a wide range of options, it can be challenging to select the most efficient, budget-friendly water heater. Add to that space restrictions, especially in older, historic Richmond homes that lack closet and storage space, and it seems like a tall order to find something that is discrete, but reliable. At Carroll Plumbing & Heating Inc. we’ll help you decide on the best equipment for your family’s hot water needs and the available space in your home. Learn all about the plumbing services and installations we offer Richmond homeowners. Don’t hesitate to contact us with any questions you may have on making the switch to tankless!